Greensville’s Lenah Clements, No. 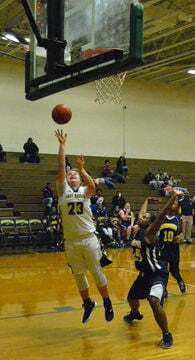 23, scores two of her game-high 28 points during Thursday’s 66-8 win against Bluestone at the Eagle’s Nest in Emporia. The Greensville County Lady Eagles stepped out of Tri-Rivers District play Tuesday and stepped on the visiting Bluestone Lady Barons 61-6 in Emporia. Leah Clements scored 18 first-quarter points and spent the rest of the evening looking for teammates and picking her spots on her way to a game-high 28 points. Trailing 7-0, Bluestone (0-14) scored its first point with four minutes left in the first quarter when Jalan Dailey connected on one of two free throws. The visitors did not dent the scoreboard again until Kayla Williams scored from the field with 7:38 left in the third quarter. By that time Greensville (9-2) had built a 46-1 advantage. Sanijah Robinson scored 13 points for the Lady Eagles. Jazlyn Jefferson narrowly missed double-figures scoring with nine points. All 11 Lady Eagles played significant minutes. Also scoring for the green and gold were Kailin Pleasants, five points, Clynesha Robinson, four points, Malana Hill, four points, Kamari Ferguson, two points and Jacqueline Hill, two points. Bluestone was led by Dailey’s three points.